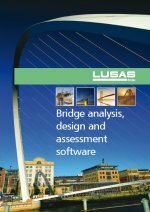 LUSAS Bridge is used by engineers worldwide for all types of bridge analysis, design and assessment / load rating. 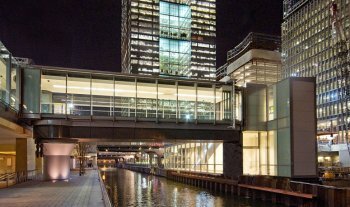 These case studies show illustrative uses of the software for movable bridges, with the most recently added article at the top. Country flags relate to the project's location. EC Driver used LUSAS to carry out a three-dimensional frame analysis of the double-leaf, trunnion bascule leaves to investigate the forces, moments, shears and reactions in the various members of the complex structure. Construction engineering analyses for a vertical lift bridge including the determination of stresses and displacements during the launching of a massive steel truss. �The use of LUSAS helped us prove our erection design. 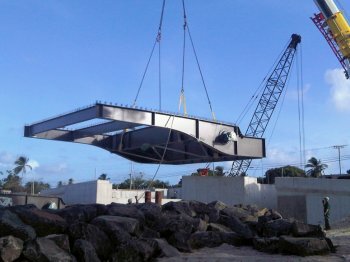 Early communication between the client, Massachusetts DOT, the Contractor, J. F. White, and FINLEY created a design that took the Contractor�s strengths into account and maximized the use of existing support structures to create a reliable and efficient erection plan". World's first triangular-leaf lifting bridge. 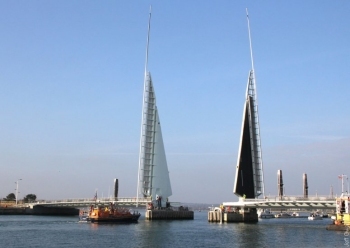 Twin Sails Bridge is a novel steel bascule road bridge that spans a navigation channel linking Holes bay with Poole Harbour in the UK. Ramboll worked closely with architect Wilkinson Eyre and mechanical engineer Bennett Associates to develop the bridge concept and used LUSAS Bridge analysis software to assist with its design of the crossing. 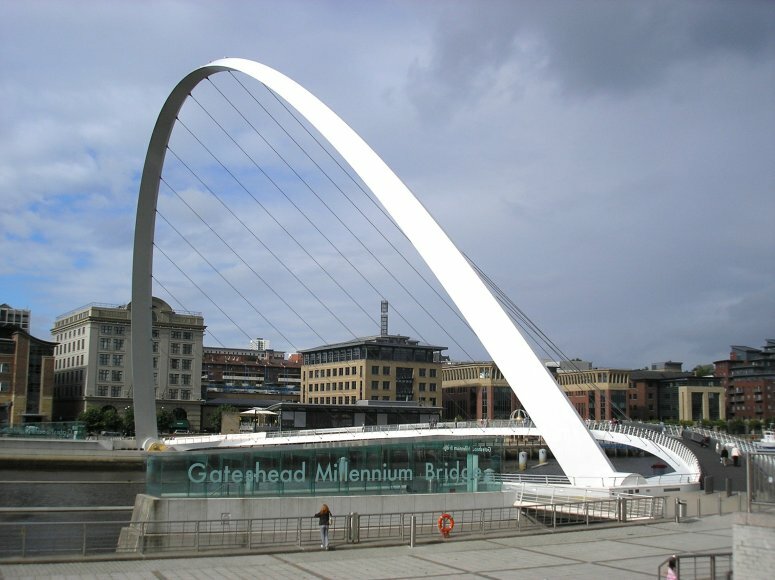 Design of a visually stunning, asymmetric cable-stayed pedestrian swing bridge. 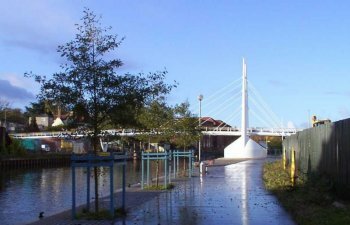 Design assistance, thermal assessment, and development of construction method for a cable stayed swing footbridge with a cranked back span. 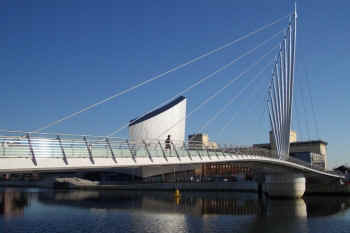 Cathedral Green Footbridge is an award-winning pedestrian and cycle cable-stayed swing bridge. It has a 30m main span and an 18m cranked back-span that counterbalances the main deck. 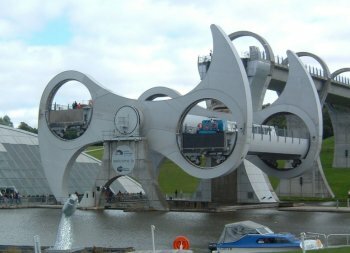 The bridge rotates on a pintle bearing, with a central wheel to support its weight and swings to one side automatically when the river is in flood. 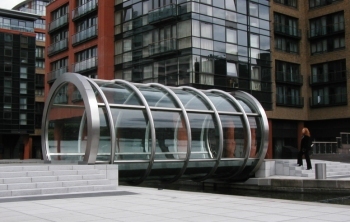 "Finite element analysis with LUSAS was essential on this project and proved that the differential movement between the glass and the steel helix was within the strain limits of the silicon adhesive." 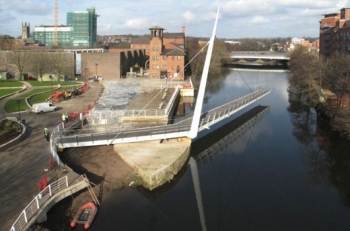 "Analysis with LUSAS was needed in order to calculate the amount of pre-camber required to ensure closure due to a 120mm deflection along the length of the cantilever span." "We needed assurance that the axially loaded joint ( in the main axle situated just inside the clawed arm) would not prise apart, and the results from the LUSAS model formed a vital part of this assurance." Richard Prosser, Project Engineer, Tony Gee and Partners. "Using LUSAS was the only viable way of analysing the structure for the multitude of loadcases that had to be considered - in effect, we couldn't have done it any other way." 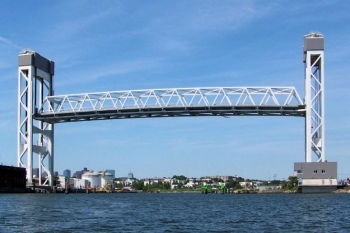 "Using LUSAS was essential on the design of this bridge because a full 3D staged construction analysis to model the construction sequence, and a step-by-step integration with large angles, to model the opening and closing sequence was required."